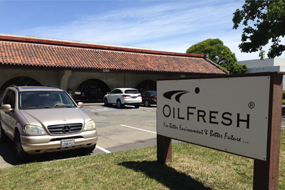 Founded in 2005 in Sunnyvale, California, OilFresh Corporation brings Silicon Valley's spirit of innovation to the foodservice and hospitality industry with its OilFresh OF1000 Series of frying oil extenders. Poised to Revolutionize the restaurant industry's approach to deep frying, these catalytic oil conditioning devices dramatically reduce the breakdown of frying oil. Patented and NSF certified, the OilFresh technology can double the usable life of frying oil..The OilFresh OF1000 Series received the 2008 Kitchen Innovations Award, a National Restaurant Association award honoring innovations addressing the needs of foodservice operators including energy conservation, productivity and safety improvement. The OilFresh OF1000 Series devices are designed for deep fryers from major fryer manufacturers including Frymaster, Dean, Pitco, Vulcan, Henny Penny, Imperial, American Range and many more. North American Association of Food Equipment Manufacturer member. OILFRESH and the OILFRESH logo is a registered trademark of OilFresh Corporation in the United States and many other countries worldwide.